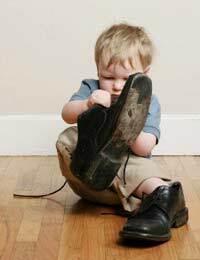 Unless your child complains that their shoes are hurting you may not be aware that your child needs new shoes. Periodically checking that shoes still fit properly, and that they are not worn in places or stressed at the seams, will help you identify if it is time for a trip to the shops. When is the Best Time to Buy Shoes? Because our feet generally swell throughout the course of the day, the best time to purchase shoes is late afternoon or early evening. Most children would rather be doing something else, than shopping for shoes, so ensuring that your child has a few distractions – particularly if they are very young – will also help make the experience more pleasurable. Children will outgrow shoes, rather than wear them out, so unless you are buying for a special occasion it is not worth buying expensive footwear. If you are fortunate enough to have a shoe store that specialises in children’s footwear this is the best place to go. Here trained sales assistants will not only be able to measure your child’s feet accurately, but they will also know the best way to get a reluctant child to try on different styles. Measuring your child’s feet will enable the sales assistant to find a shoe that fits perfectly around the heel and across the toes, with sufficient room for growth. Feet should be measured whilst the child is standing, and both feet should also be measured in case there is a difference in size. Once your child is wearing the shoes, you have selected, make sure that their feet are extended fully. There should be about half an inch of space between the end of the child’s toes and the edge of the shoe toe. Children’s shoes should always have some kind of adjustable fastening – laces and Velcro are both excellent. It is best to avoid slip-on shoes or any style that is backless, as these do not offer an accurate and supportive fit. A patterned or textured sole is also a good idea, as this provides traction and helps prevent slips. To ensure the shoe is suitably sturdy you should check that the sole is thick enough to protect the foot from injury. Choosing a style that is made from a breathable material, like leather and canvas, will also allow your child’s feet to maintain the correct temperature throughout the day. Keeping feet dry and cool protects against blisters and maintains foot health and comfort. Leather and canvas are also hard-wearing and durable materials so the shoes you buy your child should perform well. Always avoid buying children’s shoes with heels. Although some styles may be particularly popular, shoes with heels will not only create problems in the natural development of your child’s foot, but they will also be uncomfortable for your child to wear and difficult to walk in. Sticking to shoes with flat and even soles provides the best form of foot protection.